History :: Taniguchi Hoshoku, Inc.
A senior high school student set up a factory to manufacture metal molds. This is where it all started for Taniguchi Group. In the late 1960s the business became a jewelry manufacturer. The company commenced to provide jewelry collateral loans, developing into a diamond importer and wholesaler in the 1980s. 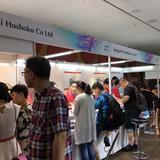 The company recorded the highest volume of jewelry collateral loans in Japan. The company developed into a setting manufacturer and, although a late starter in this business, grew its share by releasing more than 1,000 new settings a month. Two pawnbrokers, handling brand-name items and luxury watches, were established in 1998. Taniguchi Group entered the real estate business in the late 1990s, after the collapse of Japan’s bubble economy. The group currently owns more than 100 residence buildings. The focus of the jewelry business is currently on actively developing sales to mainly Asia and the rest of the world. In order to secure stable profits, the real estate business continues to purchase properties in accordance with Taniguchi Group standards. Working with pawnbrokers and recycle shops across Japan the pawnbroking business continues to support B-to-B purchasing and selling.